I first started practising yoga while I was in university. My third year into a Bachelor’s Degree in International Relations pushed me into a hot yoga class at 6 a.m. on a Thursday. I would like to say that it was all history from there – I fell in love with the practice immediately and didn’t look back! – but that’s not my story. I didn’t fall in love with yoga right away. Whether it was the need to wake up at 5 a.m. (a time of “day” that had never existed for me before), the heated room, or the difficulty involved in moving myself through the postures, I did not feel I could ever fall in love with this practice that was so out of my comfort zone. Three years later, I proved myself wrong. I had established a daily practice at a studio that was able to show me what I was capable of. I received my yoga teacher training from Ananda Ashram in New York in the summer of 2012. 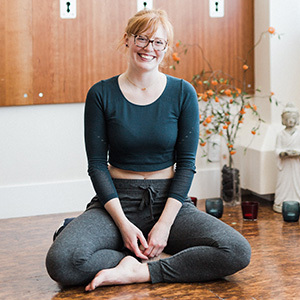 My style of teaching is one that has been greatly inspired by my own teachers – encouraging an atmosphere of lightness and fun while still providing space for introspection and self-love. I enjoy incorporating key elements of anatomy and physiology into my teaching, as well as yoga philosophy centred on wellness and compassion. Additionally, I have spent much of my life training and teaching karate. Having started my martial arts training when I was six, I was fortunate to compete in Japan in 2004 and help coach a Canadian National Team in 2012. When I’m not twisted up in yoga, I’m often found eating out at one of the many amazing restaurants throughout Calgary; playing with my puppy, Finn; or watching Doctor Who (again) on Netflix.